Galactus has arrived and he hungers! 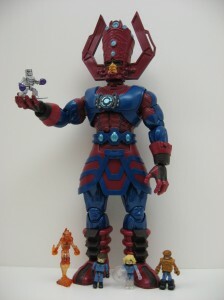 Let me start by saying that this is one awesome and huge action figure! 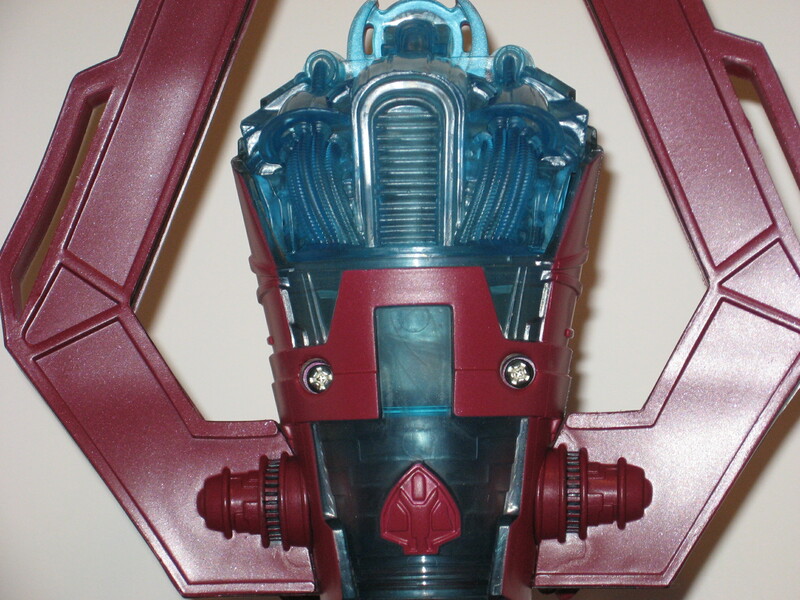 If you thought that the Marvel Legends Build-a-Figures were big, you are in for a surprise when you open up this one. 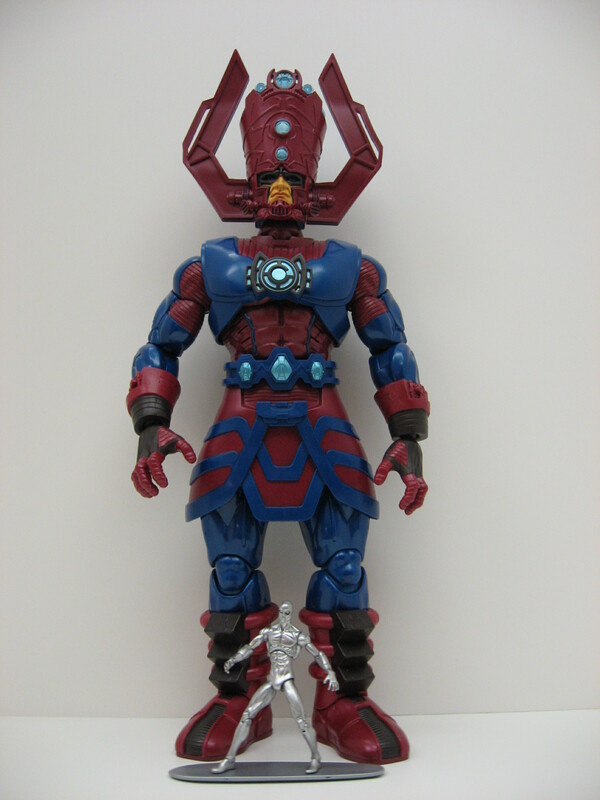 Galactus measures in at nearly twenty-inches from the top of his helmet to the bottom of his feet. But first let’s start with the packaging. 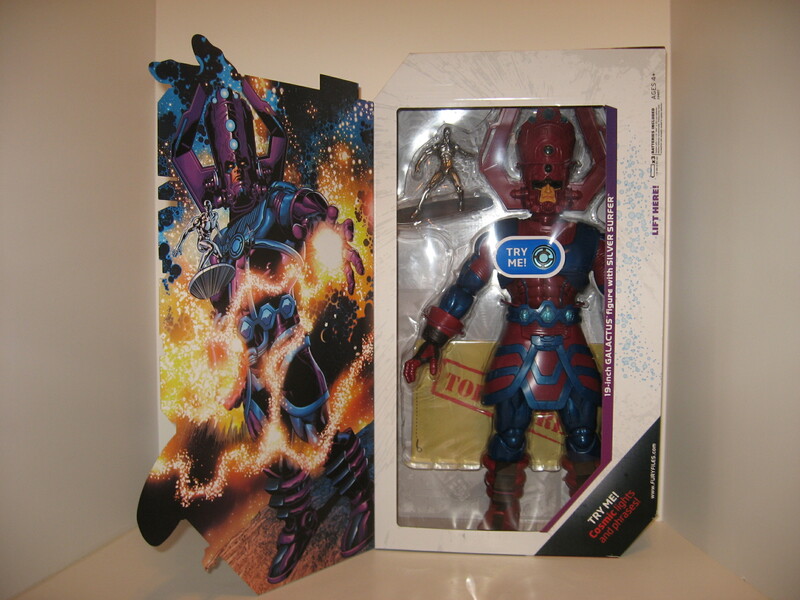 I ordered my Galactus from Toys ‘R Us.com so I was lucky to get a package that had not suffered from the “try me” feature. 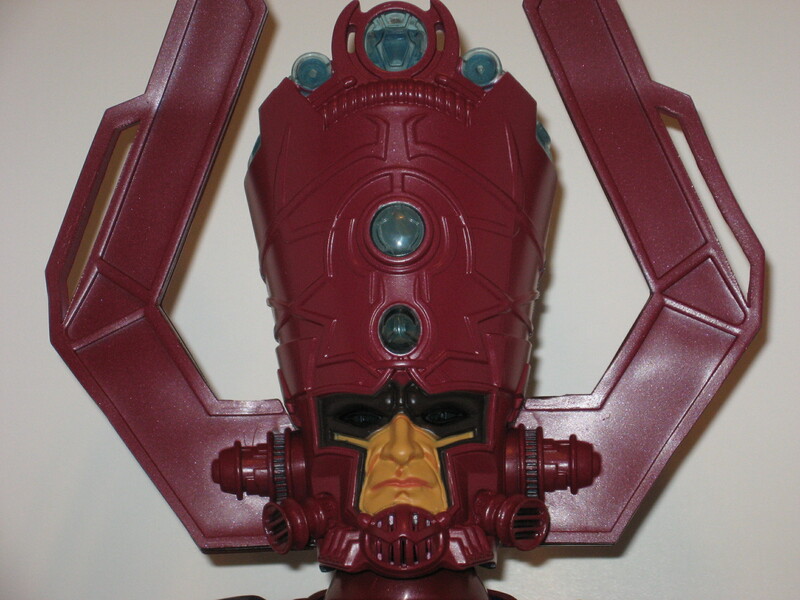 The box has a lift-up lid with a window inside that lets you view the figure and press the button to hear him speak. 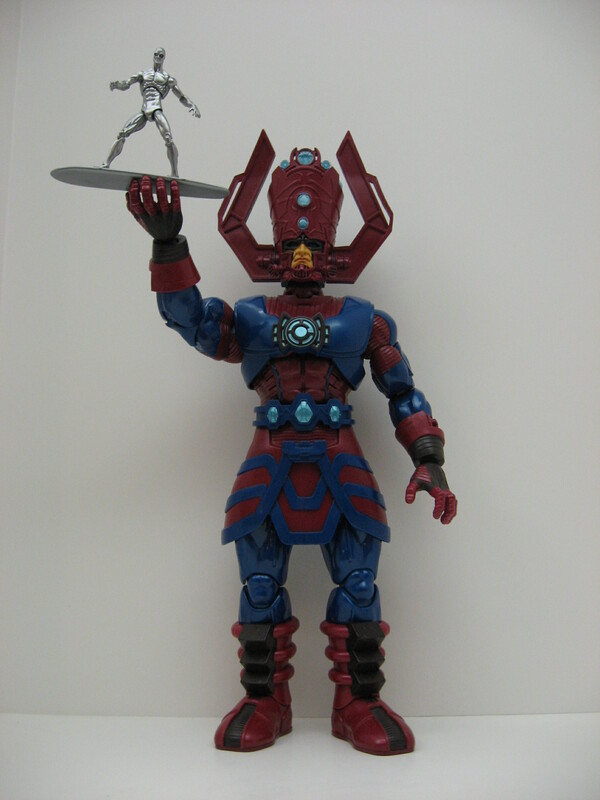 Galactus is held in place with some thick string which I suppose you could untie if you ever wanted to put him back into the box at some point. 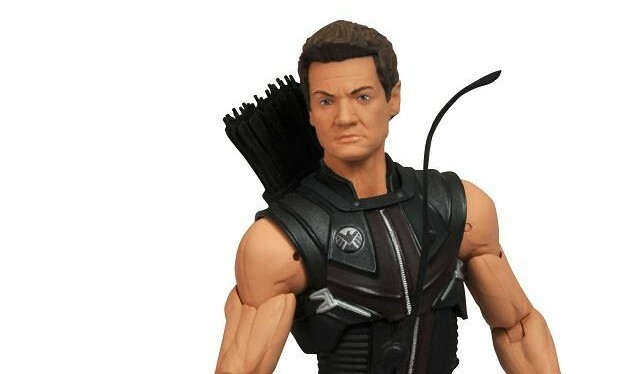 I opted for just cutting the string since I’m sure he will never go back in the box. 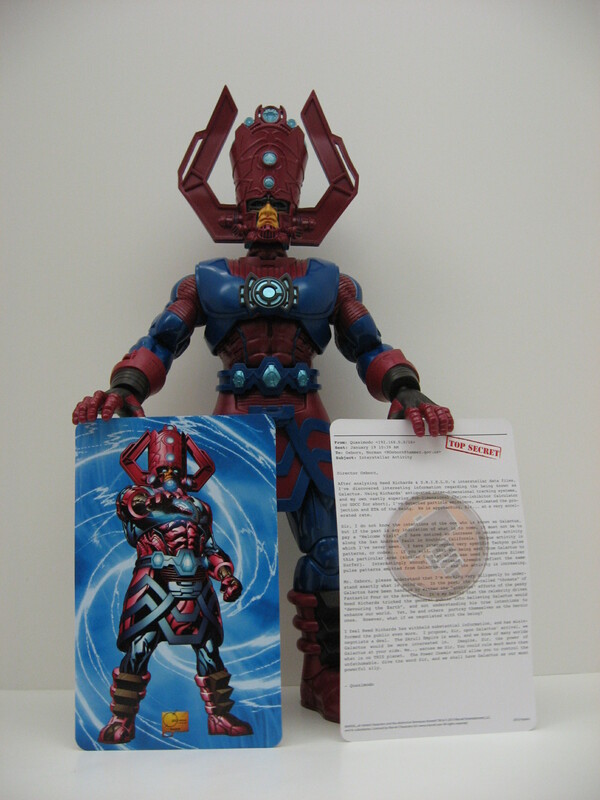 He also came with the Marvel Universe Superhuman Registration Act Card, Fury File, Fury File Code and an instruction sheet for changing the batteries (3 AAA’s included.) 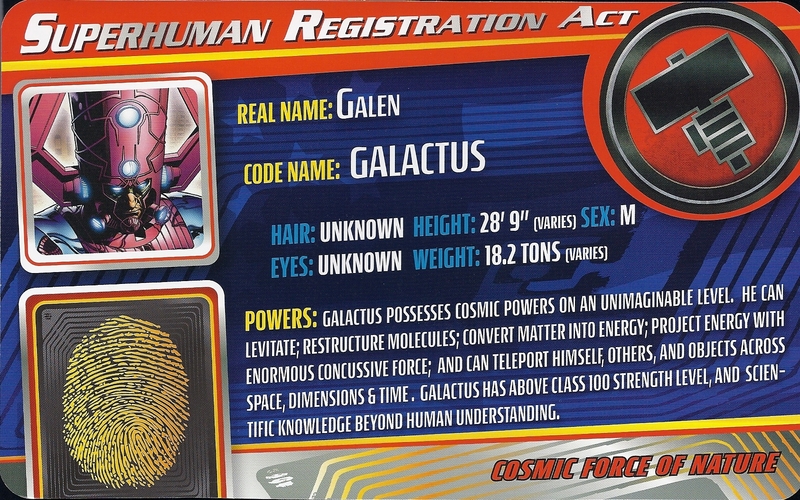 The Superhuman Registration Act Card for Galactus is bigger than the standard cards that come with the 3.75 inch figures though, it measures 8-1/2 inches. 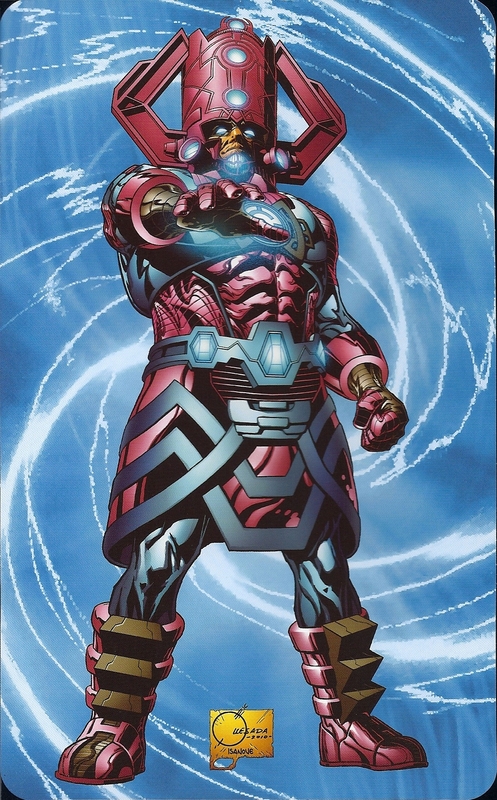 A big figure, needs a big Superhuman Registration Act Card right? 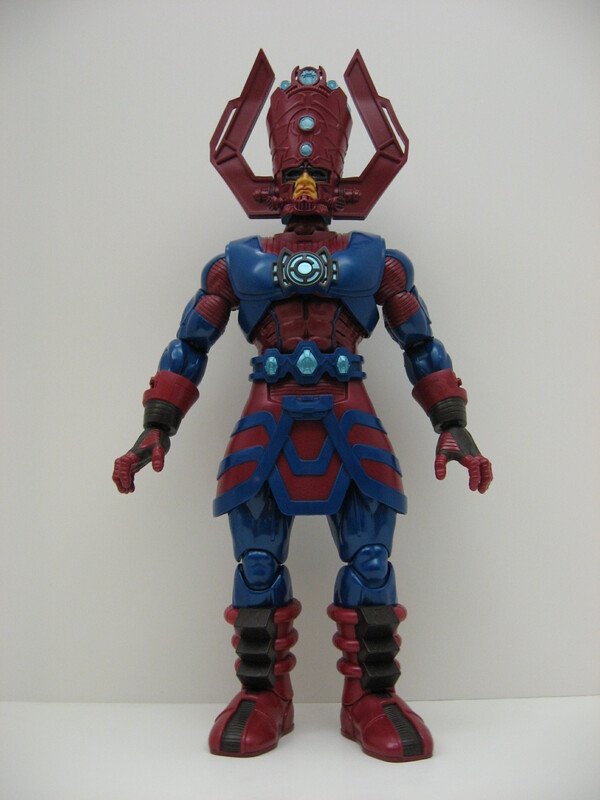 The articulation is also well done. 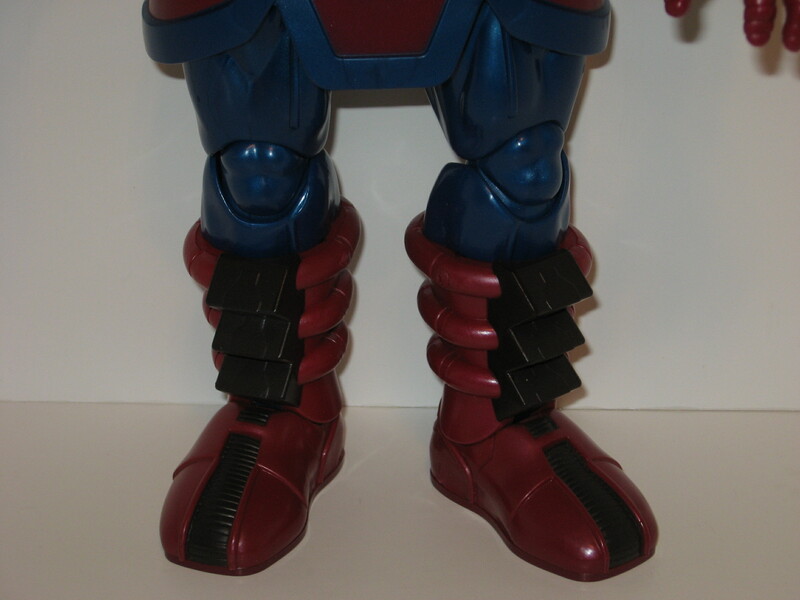 He has ball-joint shoulders, bicep cuts, double-jointed elbows, glove cuff cuts, ball-jointed wrists, upper chest swivel, waist cut, ball-joint thighs, double knees, boot cuff swivels, and ankle joints. Not bad for a figure this size! 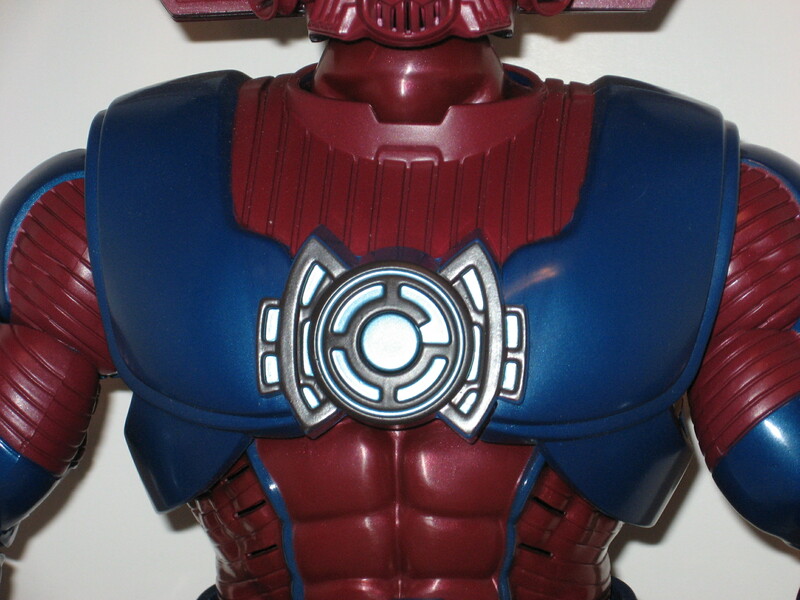 The upper chest plate and skirt are both made from a softer plastic. 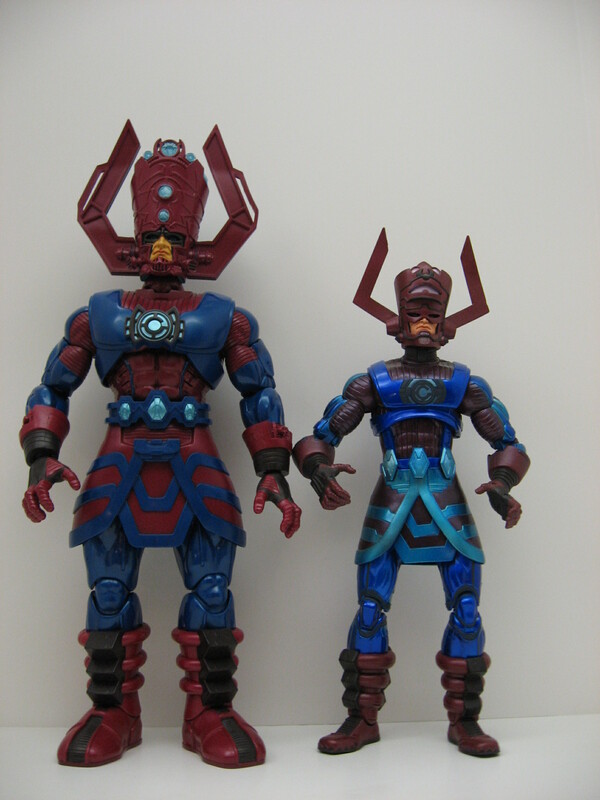 I’m guessing this was so they could re-use the body sculpt more easily for other figures later in the Masterworks line. 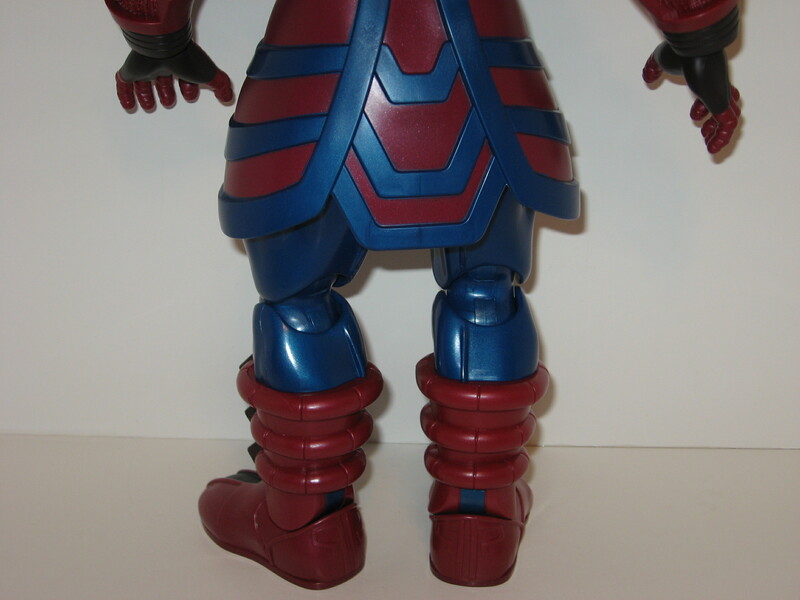 The skirt will hinder him from doing extreme leg splits but allows enough movement to move the legs apart somewhat. 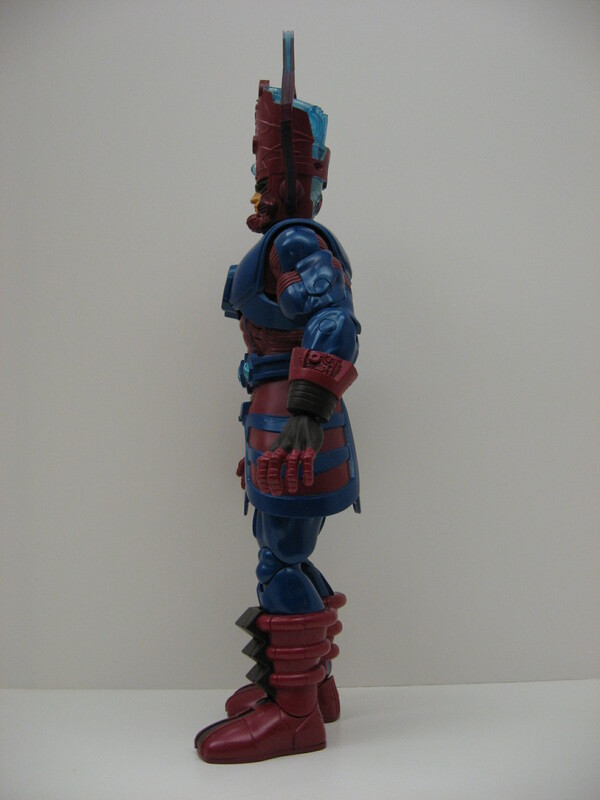 The back of the head/helmet is a clear light blue plastic which allows the lights to shine through both the back and front. 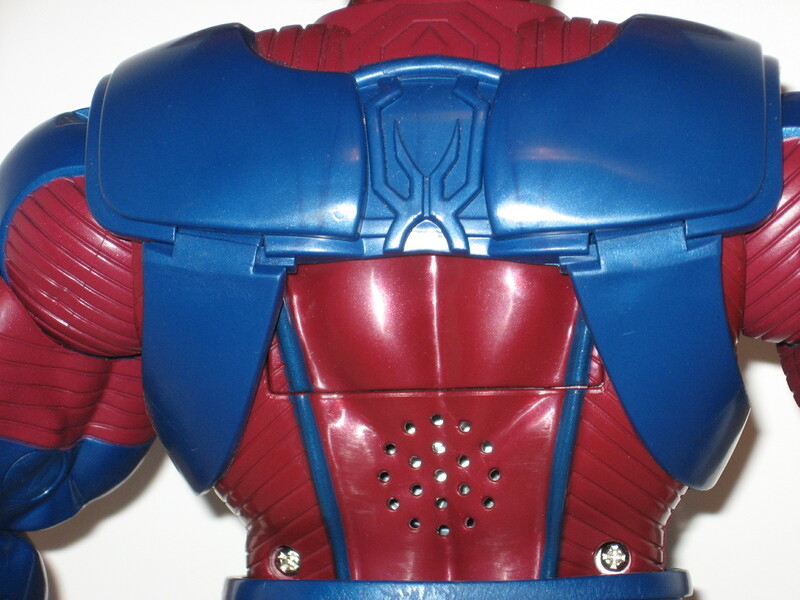 The speaker for the sounds and the battery cover are in the same area on his back in the abdomen area. 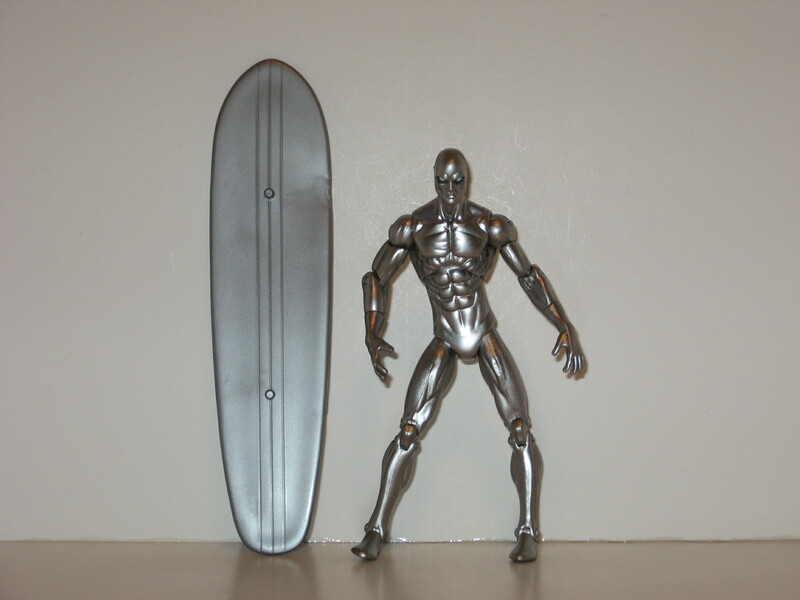 As an added bonus you also get a Marvel Universe Silver Surfer and surf board. 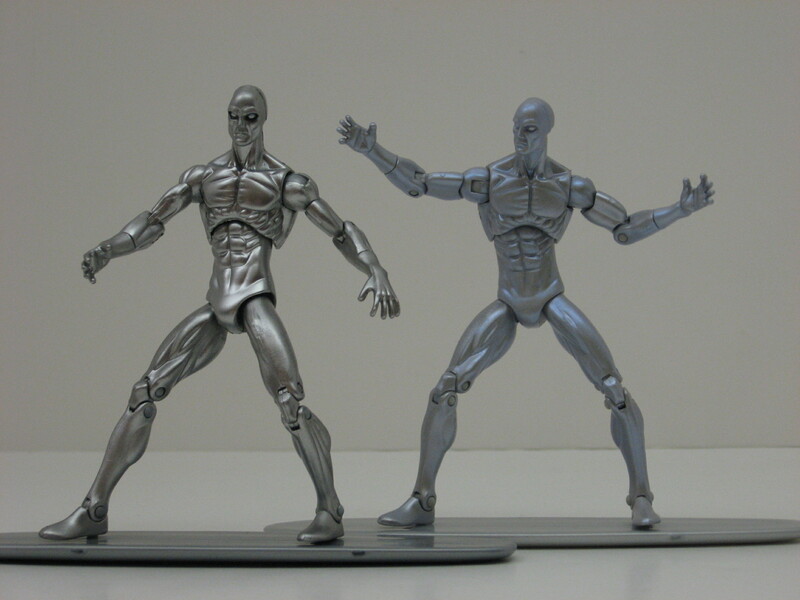 The Silver Surfer is identical to the previously released single-carded figure. 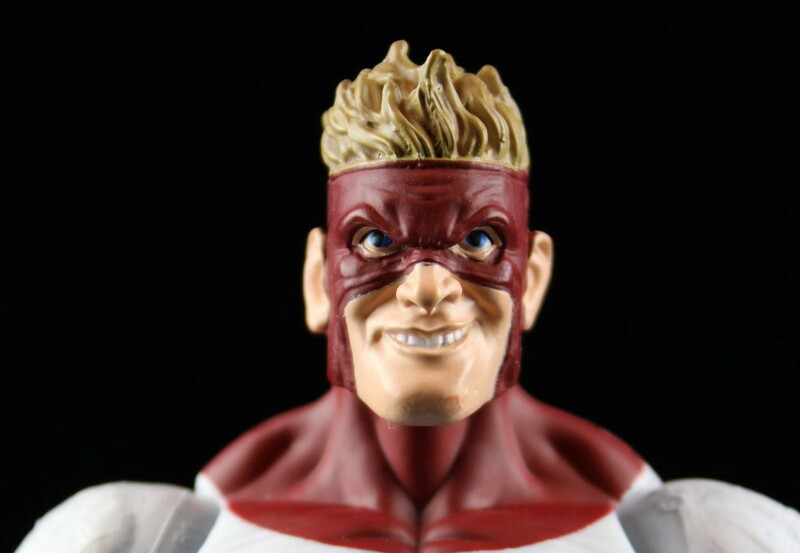 This Surfer is a bit more shiny and has some highlights around his eyes. 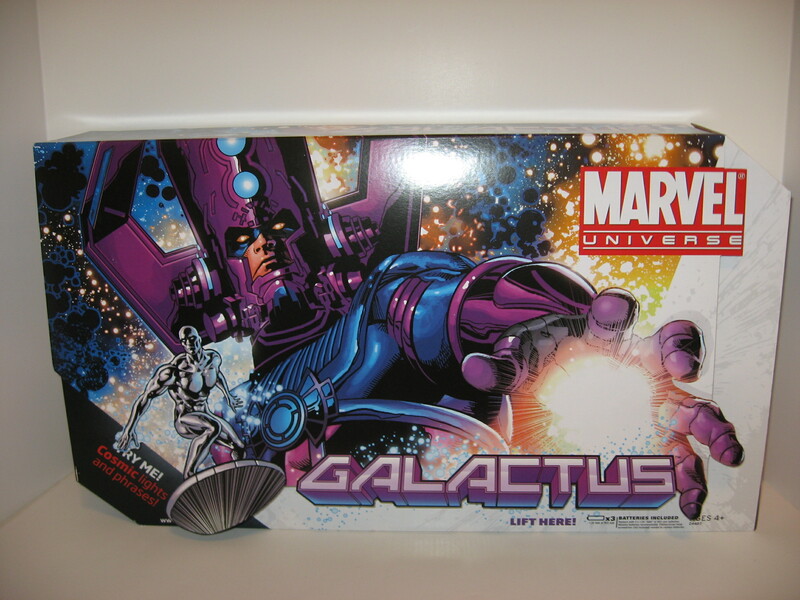 I was hoping for an all-new sculpt on the Silver Surfer or at least some calf articulation. I would have even been happy with some “knee-bro’s” in his case. 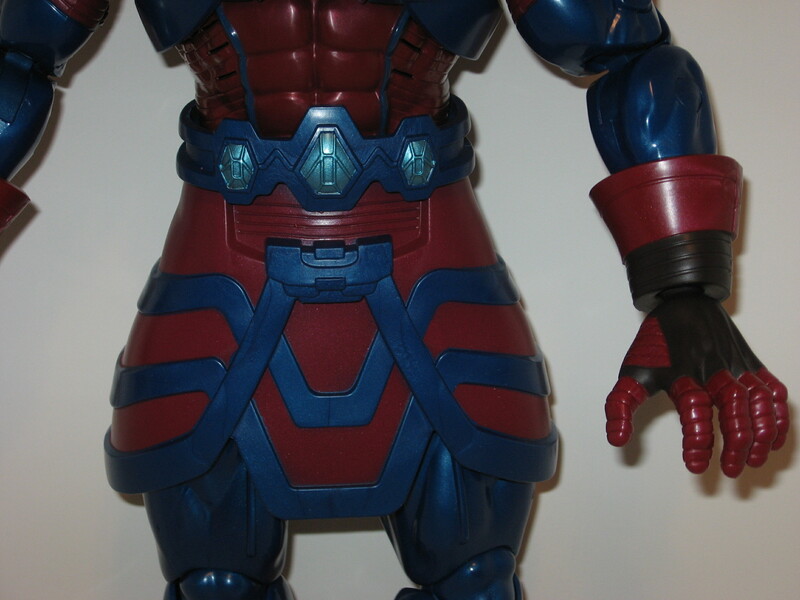 The left leg on my Surfer was a bit bent coming out of the package due to the action pose. 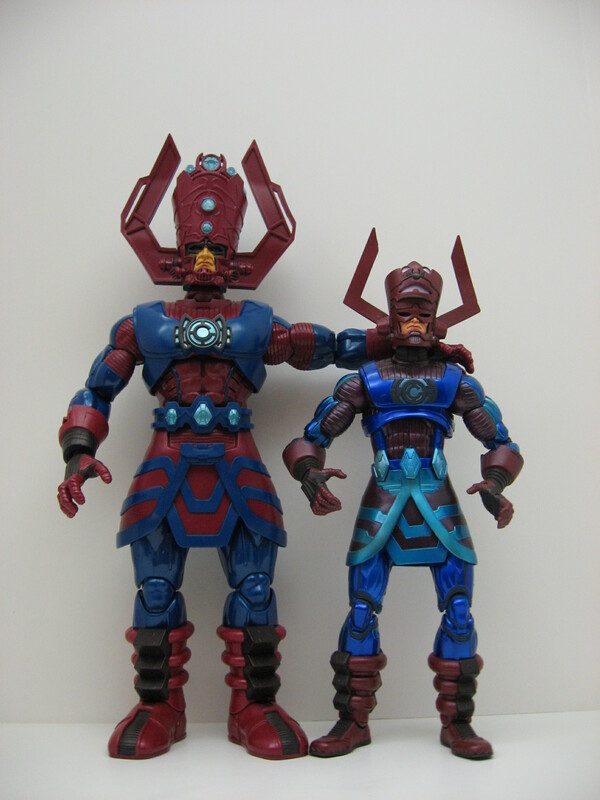 I haven’t heard any reports of the Ultimate Alliance variant shipping yet, but I plan to get one of those as well. 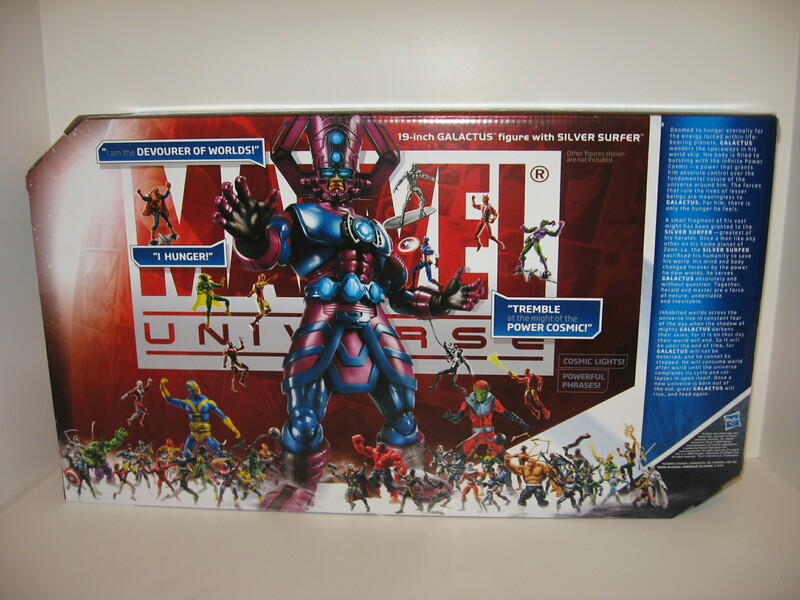 I will likely display the standard version with my Marvel Universe figures and the Ultimate Alliance version with my Marvel Legends. 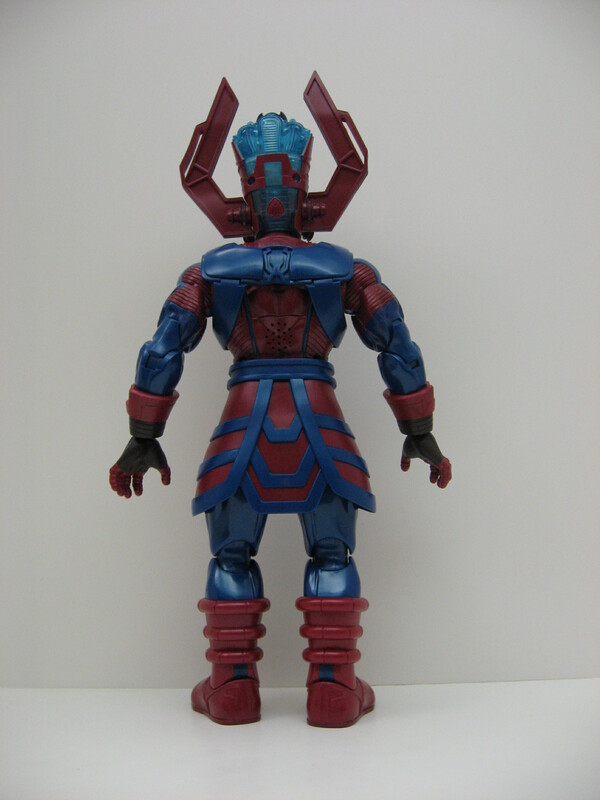 I may even retire my Marvel Legends version since he is beginning to suffer from the fading skirt color problem that is common, with many other collectors. 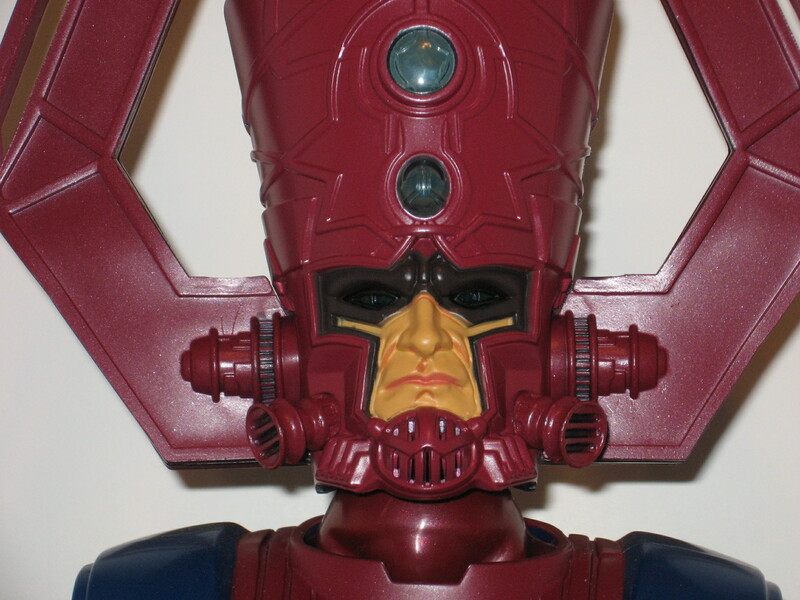 I am very happy with this action figure and I am looking forward to getting some Masterworks Sentinels as soon as possible. 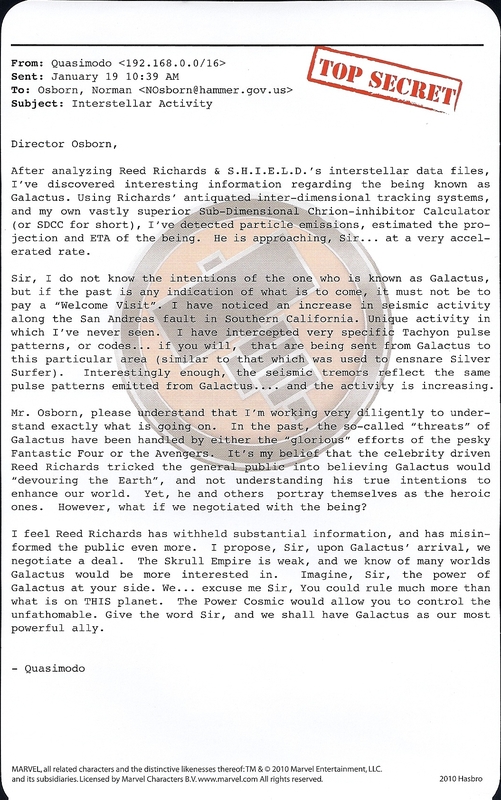 Here is a look at the Superhuman Registration Act Card front and back and the Fury File. 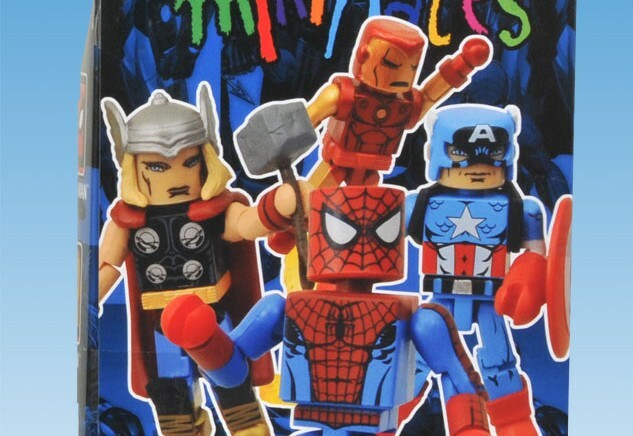 You might even want to display him with your Minimates. 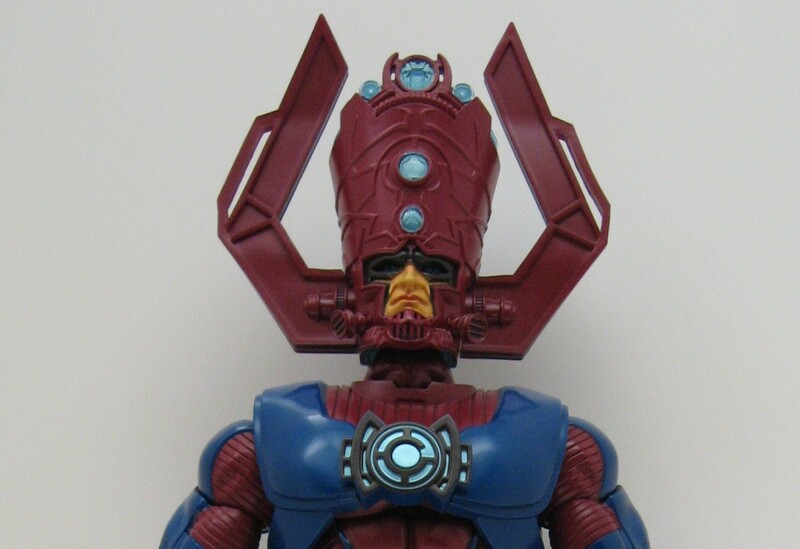 Also here is a quick video I made of Galactus speaking the phrases included with him. These are showing up in Toys ‘R Us stores in my area now, so get out there and start hunting for yours! I paid $54.99 (+ shipping, which was around $5.00) and that was a reasonable price in my opinion. Let me know if you like or dislike this figure and why in the comments below. Thanks for stopping by and happy hunting!